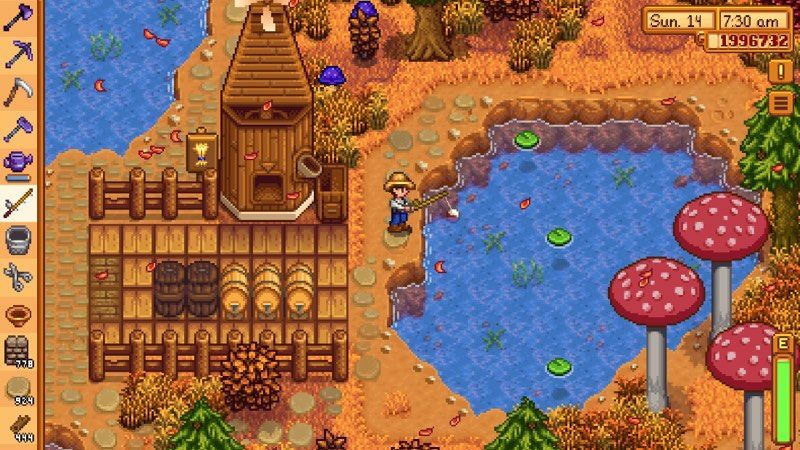 Ultra popular farming simulation RPG Stardew Valley is set to expand to iOS devices starting on October 24, developer ConcernedApe announced today. 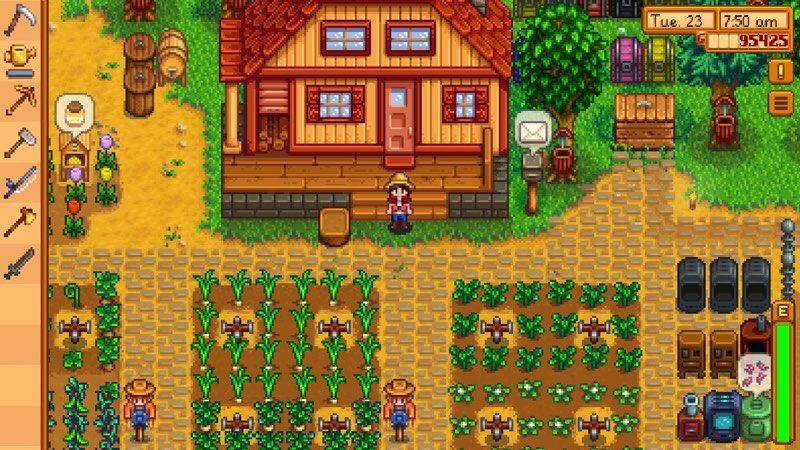 For those unfamiliar with Stardew Valley, it's an incredibly in-depth game where players take on the role of a character who takes over their grandfather's small, failing farm, working to bring it back to prosperity by planting and tending crops, raising animals, and crafting goods to sell. It's similar to other games like Harvest Moon and Animal Crossing. Players are also tasked with fighting monsters to earn money, mining ores, getting to know all the townspeople, and engaging in various social activities within the town. There are cyclical seasons and different crops and activities to partake in as the game progresses through different years. The mobile version of Stardew Valley is the full version of the game that "plays almost identically to all the other versions." It has been rebuilt for touchscreen controls by London-based mobile development studio, The Secret Police. All single-player content from the 1.3 patch, including the night market, skull cavern changes, and new character events, will be available, but the game will not support multiple players. Those who have played Stardew Valley on the PC will be able to transfer their save data to the iOS version of the game using iTunes. Pre-orders for the new iOS version of Stardew Valley are available starting today, with the game priced at $7.99 with no in-app purchases. Ultra popular? Never heard of it, but looks like it was made for the C64. Its retro design is intentional. As for you not having heard of it, it's been a tremendous success on just about every platform that's around (this is the EIGHTH platform it's coming out on) and has been a hit for a couple years, so it's your fault for being persistently uninformed. 8 quid for FarmVille on steroid? Or is it something wholly different? The farming aspect is the only thing that is similar. It's much closer to Harvest Moon. The price is absolutely worth it (and no IAP). It's gotten a lot of praise and many people have put 100s of hours into it. No, there are no freemium aspects such as timers or in app purchases. FAR better than that game. It is a full fledged game that I have put probably 200+ hours into, and will put many more into. I cannot think of how bad of a user experience this will be on touch screens... pretty much every game ported to touch screens is way inferior than their console/desktop counter part. This is my only concern. We'll have to wait and see how it is. 8 quid for one of the best-rated games of the past decade. I haven’t played any Stardew Valley on Switch or otherwise, does this seem like a game that will fare ok with touch screen only control and not physical buttons? And is this game good? I think it would work just fine on a touchscreen. As for the game being good, I enjoyed it a great deal. You farm during the day, adventure during the night, and balance the needs of your home, community, money, and even dating life with villagers. It's a cute game with an engaged dev team, and for the price is a pretty good value for a game that you can just relax and play without any nonsense. Finally! A simple game that can actually be played with no in-app purchase. That overhead view and graphics style sort of reminds me of the original Zelda game on the NES. Hadn't heard of it, but may actually buy this one. Meets many of the criteria I look for in a mobile game these days... immersive world, long playability, one-time purchase, network connection not required, and I dig the 8-bit Zelda-style graphics. 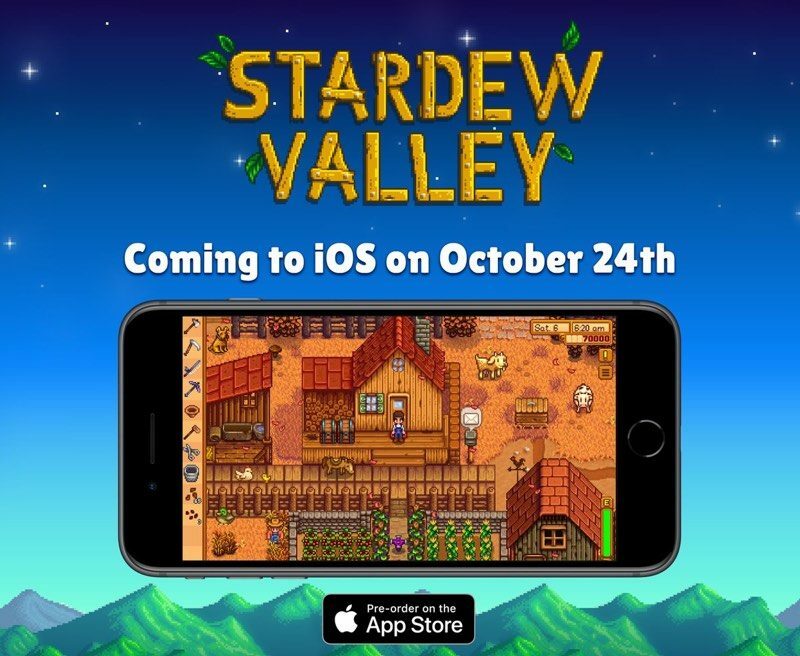 Pre-orders for the new iOS version of Stardew Valley are available starting today ('https://itunes.apple.com/us/app/stardew-valley/id1406710800?mt=8'), with the game priced at $7.99 with no in-app purchases. Looks like I'll be buying this one. Nice to see a developer who is interested in creating a fun game for everyone rather than an income stream from a minority of suckers and a miserable experience for everyone.